Reward Charts with your favorite characters! 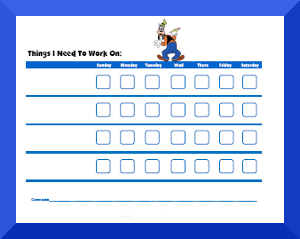 Printable behavior charts with fun characters can be great motivators for kids! Kids will enjoy putting a sticker or star on their behavior charts every time they reach a behavior goal! You can use the "comments" space to list rewards earned or comment on how the week went. Also check out our printable stickers which are compatible with our charts! Your kids will also love our Free Printable Step Behavior Charts with Your Favorite Characters! We also have Disney Jr. Behavior Charts and Nick Jr. Behavior Charts. If you don't see a character that you like, please drop us a line and we'll make up a chart for free!